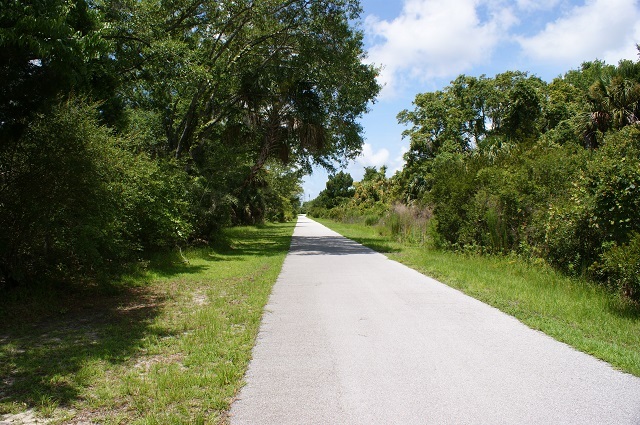 One of two GFBWT locations on the 90,000-acre, 110-mile Cross Florida Greenway, this site offers a multitude of exploration options for visitors of all mobility levels. West of the US 19 bridge is the Withlacoochee Bay Trail (WBT), a 5-mile, paved multi-use trail that follows the south shore of the Cross Florida Barge Canal, then leads through maritime hammock and salt marsh, finally ending at an observation deck on the Gulf of Mexico. Want to bird by car? Another paved trail for vehicles parallels this trail. Numerous pull-offs allow you to take your time and soak in the surroundings. Wading birds and shorebirds frequent the shoreline and sparrows (such as Vesper, Song and Swamp) hide in vegetation along the trail edges. Bald Eagles, Mississippi Kites, Common Nighthawks and Common Ground-Doves are possible; watch for passerines in the scrubby areas near the entrance. The Eastern Pygmy-Blue butterfly occurs in the salt marsh from March to October. Along the south side of the WBT, a series of foot trails and old logging roads in the 500-acre Dixon Hammock permit observation of numerous songbird species. The coastal waters (tidal flats, estuary and salt marsh) and spoil islands directly offshore have waterfowl (including Common Goldeneyes on occasion) and shorebirds in fall/winter, including large groups of American Oystercatchers (a spotting scope is useful here). East of the bridge is the Felburn Park Trail, a 1.5-mile footpath around Phil Lake (an old quarry site).